Jumbo jets, train cars, covered wagons, and the ocean floor — would you sleep here? People seem to have an innate fascination with conceptualizing wacky hotels, as well as paying hard-earned money to sleep in them. Last year, Trips introduced you to Igloos, Castles, Sewage Pipes, and Survival Pods: The World’s 10 Weirdest Hotels. But there’s so much more material out there we felt it was time for a sequel. * Cape Town, South Africa’s Grand Daddy hotel brings something new to the penthouse crowd. 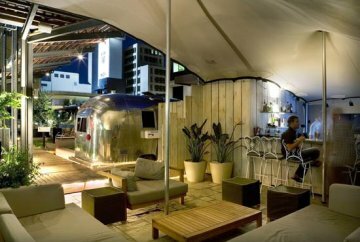 They’ve reclaimed and creatively redecorated seven Airstream travel trailers and dropped them on the hotel roof. * In Christchurch, New Zealand, Wagon Stays offers all the perks of a studio apartment (kitchen, bathroom, bed, plus TV and Internet) in the confines of a mock-up, settler-era covered wagon. * As Tom Gates recently inquired over at Matador Nights, Pimp My Jet? 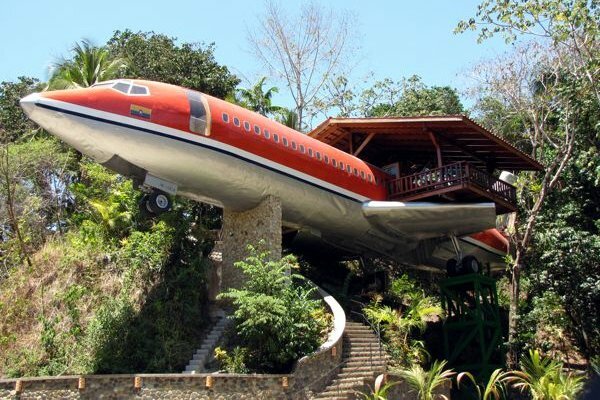 Yes, the Hotel Costa Verde, located just outside Costa Rica’s Manuel Antonio National Park, has created a two-bedroom suite out of a salvaged Boeing 727. * Sticking to the airborne theme is Winivan, a complex of luxury cottages in Connecticut. One of their properties includes a refurbished Coast Guard helicopter, complete with kitchen, sofa, and swiveling pilot’s chair. * Jules’ Undersea Lodge, off the coast of Key Largo, Florida, claims to be “the first and only underwater hotel” (the others in this list have yet to open). It’s also the site of ongoing marine research projects. This place is for real — to enter, guests scuba down 21 feet to the “moon pool” entrance. Quarters are tight, with two small bedrooms and a common room available. Groups of up to six people can be accommodated. * If you want under-ocean views and luxury, you’ve gotta wait till next year, when two pretty spectacular-looking properties are set to open (or so go the rumors). The first is Fiji’s Poseidon Undersea Resort. The facility will be a mile long, decked out with a restaurant and suites all featuring windows on the water and the abundant marine life outside. You’ll only scuba here if you choose to — access is via a more “civilized” 40-foot elevator. 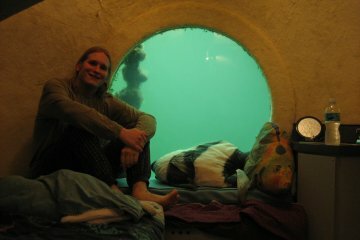 Guests can also tool around in a mini-sub. * I’m not sure I could think of a less obvious location for an underwater resort than Istanbul, which is also supposedly building a submerged hotel. The seven-story structure will have plenty of windows from which to admire the average ten feet of visibility in the Bosphorus Strait. How about a hostel in a jet? Check out the World’s Most Unique Lodging: A Look Inside the Jumbo Hostel. If you enjoyed the video in this post, head over to browse the best travel video on the web at MatadorTV.